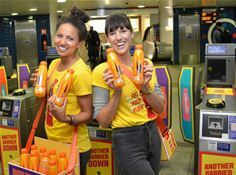 London, 02nd June, 2017 - MuchBetter.com, a London-based fintech has made an impressive market debut by utilising its MuchBetter product and technical capabilities to support leading energy brand Lucozade Energy during a vast marketing campaign across London train stations this week. MuchBetter.com partnered with GPS to produce a revolutionary paytech bottle that was distributed free at major London train stations and commuter hotspots. Each special bottle includes a contactless payment chip preloaded with a credit to pay for one journey on the London Underground. The young fintech MuchBetter designed the Lucozade Energy paytech bottle with Global Processing Services (GPS), the leading emerging payments issuer processor and DIGISEQ, a new company who securely turns wearables and the IoT into payment devices. Keeping people hydrated and energised, while travelling, especially in hot busy environments such as the London underground, is essential to good health and a safe journey. Lucozade Energy is the nation’s biggest energy brand and is closely associated with energy and active lifestyles. The paytech bottle supports the Lucozade Energy “Find your flow” campaign by bringing efficiency and speed to the commuter journey through contactless payment. London’s emerging Financial Services industry is very vibrant and full of energy, with many young companies using innovative technology to build new financial products that simplify and enrich people’s experience when dealing with money. Israel Rosenthal, CEO MuchBetter stated: “When MuchBetter was approached to support Lucozade Energy’s “Find your flow” campaign as contactless payments partner, we could instantly see how our product capabilities and payment technology fit the vivid brand. We felt honoured to support Lucozade Energy’s idea to demonstrate how modern technology can be embedded into products that people carry and use every day to create improved consumer convenience and enhanced lifestyle. DIGISEQ was formed in 2014 and has become an essential part of the Internet of Payment Things; delivering payments accounts Over the Internet – eliminating complex processes associated with the Payments world. DIGISEQ enables the device manufacturers to maintain their existing supply chains, stay true to their own brand and to expand their services to include digital services including payment. Lucozade Ribena Suntory (LRS) is one of the leading soft drinks businesses in the UK and Ireland. LRS was formed in 2014, and is part of Suntory Beverage & Food Europe. Our much-loved soft drinks brands include Lucozade Energy, Lucozade Sport, Ribena, Orangina and V Energy. We put consumers at the heart of everything we do and our business is driven by our “Yatte Minahare” spirit. Our vision is to revolutionise the soft drinks industry by creating premium unique drinking experiences with an adult touch. For further information, please visit http://www.lrsuntory.com. LUCOZADE ENERGY is a registered trade mark of Lucozade Ribena Suntory Limited.